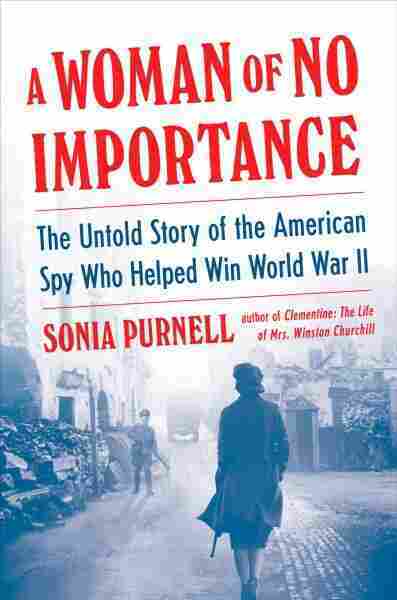 WWII Spy Virginia Hall, The Subject Of Sonia Purnell's 'A Woman Of No Importance,' Was Anything But A very smooth read about a rocky life, Sonia Purnell's biography of the masterful WWII spy is a reminder of what can be done with a few brave people — and a little resistance. It sounds like propaganda meant to misdirect WWII Germans: a lone foreigner running riot in occupied France, everywhere at once, unrecognizable despite a trademark gait, able to bewitch information out of anyone, single-handedly stirring up resistance — and then vanishing. The German secret police couldn't even be sure what country she was from. It would be easy to believe the Limping Lady wasn't real. Virginia Hall was one of the earliest Special Operations Executive agents Britain sent into occupied France to stir up resistance against the Nazi/Vichy regime, where she laid critical groundwork for an organized Resistance in southern France — and later led a cell herself. She isn't totally unknown; there have been other biographies, as well as a CIA training hall named in her honor and even a Drunk History sketch. But Sonia Purnell's A Woman of No Importance is a gripping take, tracing Hall's life in the context of hurdles she faced from allies — as much as from enemies. She was an unlikely choice for SOE field work; she was a woman, she was American, and she had a disability (a hunting accident left her with a wooden leg she called Cuthbert) that made her easy to identify. But the speedy Nazi takeover of Europe was more alarming than the usual prejudices, and in 1940 she was in France with only the barest brief — build a Resistance, no matter what. The story is clearly Hall's, and her achievements beggar belief, from escaping France through the Pyrenees (with Cuthbert intact) to the sixth sense that repeatedly kept her from capture. But Purnell smooths a staggering cast and timeline into a brisk narrative. And though Hall's impact is astonishing, the book makes clear how many people a Resistance requires. Lyon madam Germaine Guérin was harboring Jewish refugees and Allies before Virginia Hall ever got there, and stands out in the telling. But the nameless young lady in 1942 who got off a train and asked for black coffee and three aspirins at a cafe also saved lives — it was a signal to the locals the Gestapo was on to them. Stakes are rarely an issue in a book about WWII; its rhythms are a shorthand, and we've come to expect hairy near-misses, unlikely escapes, and devastating double agents. Still, Purnell finds fresh dread in the growing efficacy of surveillance, the Vichy regime's tactics, and propaganda campaigns where "the same false messages were pressed home again and again until they were almost universally believed, even when flying in the face of incontrovertible facts." And though the international stakes shrink sharply, the air of menace follows Hall after the war into the American Office of Strategic Services (OSS) and, eventually, the CIA. The primary enemy here was the mundane tyranny of sexism that stymied her career (a man in the department referred to her as a "gung-ho lady left over from OSS days overseas" only a few years after the war), and Purnell tracks the infuriating infighting between pro- and anti-Hall factions with the same seriousness as the French campaigns; there's more than one kind of war. Though that hostility explains much about Hall's patchwork assignments in American intelligence, it also feels as if more personal insights are missing. (Perhaps literally: Purnell notes "[w]hole batches of papers at the National Archives and Records Administration...have apparently been mislaid".) Hall's war motivations were clear; she felt the horror of Nazi and Vichy cruelty and was determined to help. Purnell's picture of a postwar world is a fractured, ethically muddy arena of conflicting operations, and we're left without much sense of what Hall thought of those assignments — some of which pitted her against factions she'd worked with during the war. But maybe this only feels like a loss because Hall is such a vivid presence elsewhere. Though the minutiae of her missions are gripping, Hall shines through in every dispatch with human complexity; popular and lonely, patient and short-tempered, depressed and determined. A very smooth read about a rocky life, A Woman of No Importance is a compelling biography of a masterful spy, and a reminder of what can be done with a few brave people — and a little resistance.